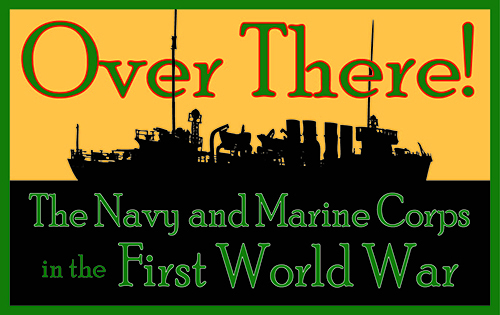 "Over There: the Navy and Marine Corps in World War I"
From August 2015 to May 2016 the Museum hosted "Warrior Writers" an exhibition examining the unique partnership between the Museum and the United States Naval Institute and highlighting the importance of Naval Institute to the Navy. 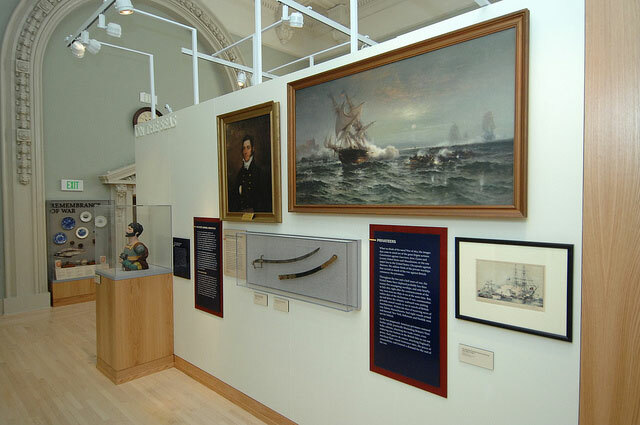 Drawing from the collections of both the Museum and Naval Institute, "Warrior Writers" explores the importance of the Naval Institute as a professional society for discussion and debate on historical and current events related to the Sea Services. 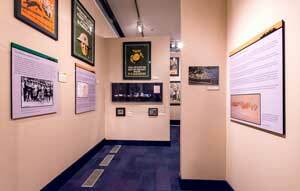 From January to March the Museum displayed "From Conception to Present." 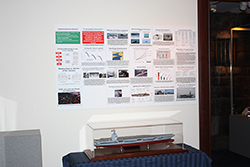 The exhibition coincided with one of our Shifley Lectures on the latest aircraft carrier and our naval debate on the future of aircraft carriers. 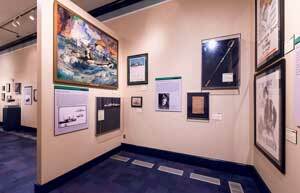 The exhibit highlighted the history of the carrier from USS Langley to USS Ford. 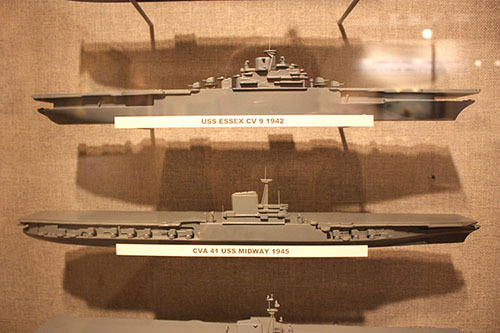 Of special note were the carrier ID models from World War II to the nuclear age, five concept models for USS Ford, and a model of USS Ford. 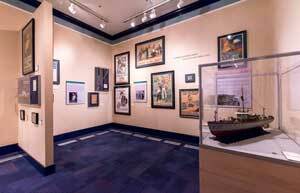 From April to June 2014 the James W. Cheevers Gallery hosted "U.S. Navy Ships of War 1898-1991" An Exhibition of Original Paintings by Jim Griffiths. 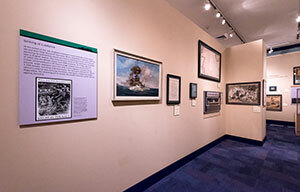 Jim Griffith's watercolors are impressive representations of United States Navy Ships. As a watercolorist, a draftsman, a meticulous researcher, and a sophisticated colorist, Griffith's work is admired by naval historians, naval buffs, and collectors. Mr. Griffiths discovered his passion for painting ships and the sea early in his career and has been pursing marine art exclusively for many years. 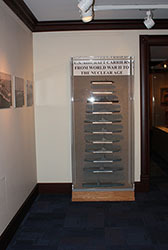 A special area of interest to him is post-1940 steel naval vessels. It is perhaps in these paintings that the full range of his talents for precise details in combination with convincing color and light, which Griffiths handles on par with the finest marine watercolorists, can be appreciated. To ensure the authenticity and accuracy of all his works, Mr. Griffiths regularly refers to a large library of nautical books, photographs, and ship planes that he has amassed over the years. In 1989, he was commissioned to paint the official portrait of USS Abraham Lincoln (CVN 72). In 2000, the United States Postal Service commissioned Mr. Griffiths to paint four paintings which were issued as postal stamps commemorating the 100th anniversary of the United States Submarine Service. 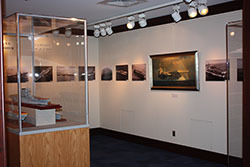 Mr. Griffiths won the prestigious Rudolph J. Schaefer Maritime Heritage Award at the 2003 Mystic International Marine Art Exhibition. The award recognizes one work in the show that "best documents our maritime heritage, past of present, for generations of the future." In 2007, he won the Best of Show Award at the 14th Annual Maritime Exhibition at the Coos Art Museum, Coos Bay, Oregon. 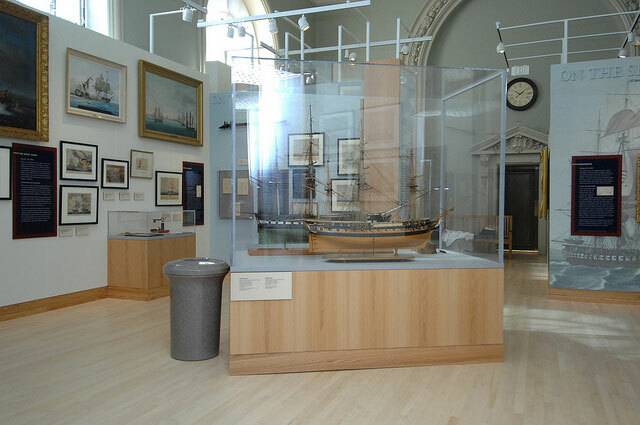 From April 1 to November 3, 2013, the Naval Academy Museum displayed "Seas, Lakes & Bay; The Naval War of 1812 Exhibit"
"Seas, Lakes, and Bay" was shown in the Hart Room on the second floor of Mahan Hall, across the street from the Museum. 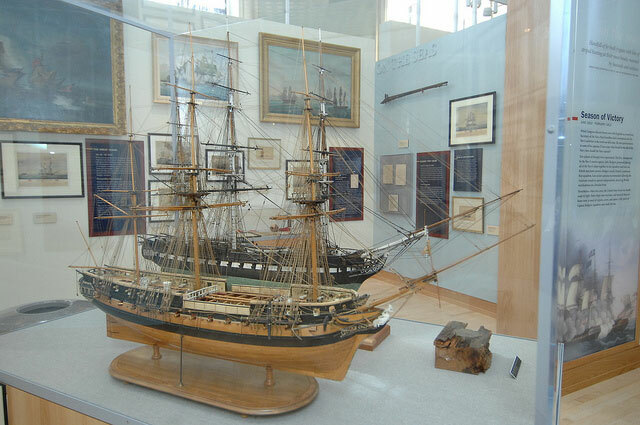 It housed a comprehensive display of War of 1812 art and artifacts from the collection of the Naval Academy Museum as well as generous loans from the private collection of William I. Koch. 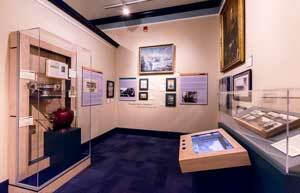 Nearly 250 items from the collection of the Museum and over 60 items graciously provided by Mr. Koch filled the expansive Hart Room room to educate visitors about the War of 1812. 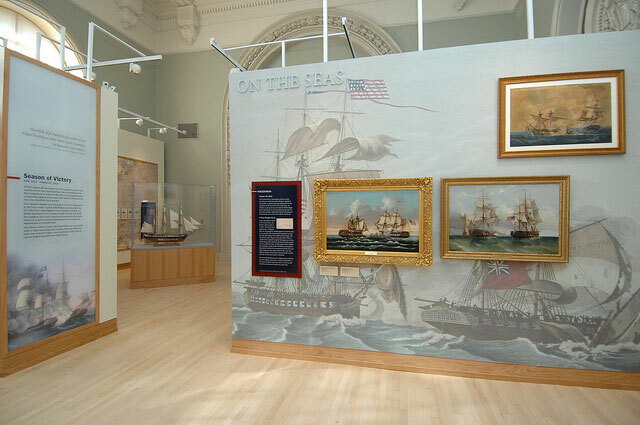 In addition to the exhibit, "Seas, Lakes and Bay" also featured a self-guided walking tour and educational publications to further the viewers' knowledge and understanding of the War of 1812 and its impact on our nation. The War of 1812 is often considered "The Forgotten War," but it should not be overlooked because it left a lasting legacy on America. It was the first real test of the United States as a nation, resulting in sense of nationhood and patriotism, and turning the United States from eighteen individual states into one country. The War of 1812 was in part a naval war, causing the United States Navy to mature and achieve renown through the exploits of its ships, officers,and crews as they protected American interests. The legacy of the War of 1812 continues today as the Academy trains and educates the future of the Navy. 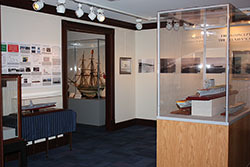 "Seas, Lake, and Bay" was the recognized for its excellence and was recipient of the Excellence in Programming and Exhibits award at the 39th Maryland Preservation Awards, given by the Maryland Historical Trust. It was also visited by nearly 20,000 visitors.